Secretary of Defense Robert Gates receives a standing ovation from President Barack Obama and Chairman of the Joint Chiefs of Staff Admiral Mike Mullen during Gates’ Armed Services Farewell Tribute at the Pentagon June 30, 2011, in Arlington, Va. But if excerpts from his new memoir, Duty: Memoirs of a Secretary at War, hold true for the rest of his book, then—net-net—Gates’ account of Obama’s White House doesn’t shed that much light on the president’s wartime decision-making. It does, though, offer a glimpse into the frustrations of a defense secretary managing two wars. I’ll hold final judgment until the book’s release later next week. But based on the parts that have already been released, Gates’ reflections seem, mostly, like the foreseeable complaints of a senior military and intelligence man about the commanders in chief—Barack Obama and George W. Bush—whom he reported to at the end of his career. And the problem isn’t, as CNN’s Gloria Borger says, that Gates spoke out “while the president was still in office.” It’s that many of his critiques are what we could have guessed on our own. He calls members of Congress “hypocritical” and “egotistical”—but folks already suspected that. He says Obama mistrusts Afghan President Hamid Karzai—but is there an American politician who would say otherwise? And Gates believes that invading Iraq took Bush’s eye off the ball in Afghanistan. Gates is (and should be) admired for helping “salvage the wars in Iraq and Afghanistan”—working overtime to convert previous Defense Secretary Donald Rumsfeld’s fiascos into manageable stalemates. With quotes, though, like, “I have walked right into the middle of a category-five shitstorm,” Duty reads more like an unburdening from a guy brought in—like Obama—to clean up the messes his predecessor made. Clearly, Gates left the job with a bad taste in his mouth. But he never articulates much difference between his and the president’s policy preferences. In the book, Gates reportedly characterizes the repeal of “Don’t ask, don’t tell” as an example of the president’s “breaches of faith”—a repeal Gates supported but, apparently, on a different timetable. But the DADT repeal took place two full years into Obama’s presidency, with the blessing of all but one of the Joint Chiefs of Staff, and it won fairly easy congressional approval. 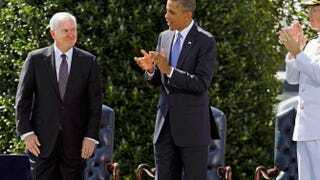 Surely, Gates couldn’t expect this civil rights milestone to move forward at his own personal pace. Nice, I suppose, for Gates to note that the boss was polite to subordinates—with the implication, presumably, that because Obama had no military experience, he should have deferred more to his commanders. But considering that Obama took over two unwon wars—in, respectively, years six and seven—the military’s top brass should have expected some pushback. Gates gripes about White House “meddling” in Pentagon planning and complains that Obama’s Afghanistan strategy was “all about getting out,” but in 2009, Obama green-lit the generals’ counterinsurgency strategy and committed 50,000 new troops to try turning the tide in that war. If Gates didn’t like the president’s attitude, then he’s entitled to that. And there’s a separate critique to be made about the fact that we’ve still got troops fighting in Afghanistan. But since he thinks that on the eventual policy, “Obama was right,” maybe Gates isn’t the best person to make it. Gates’ complaint, in the end, seems less about the moves Obama made than the way he made them. And as an experienced national-security hand—the only secretary of defense to serve presidents from both parties—Gates is in a unique position to make those observations. When he writes, though, that Obama tried to “take credit for every good thing that happened while giving none to the career folks in the trenches who had actually done the work,” Gates betrays the possibility that all this is about something else. Even though Obama awarded him the Presidential Medal of Freedom upon his retirement, you get the impression that Gates feels as if his own contributions were underappreciated. He might consider, however, that Obama probably has that same complaint.